Deciding to switch from curative attempts at dealing with COPD to hospice care is a big decision. Your elderly family member might feel at first as if she’s giving up, but hospice can allow her body the rest that it needs in order to make the most of the time she has left. COPD is rough on your elderly family member’s body. She expends a great deal of energy just trying to breathe. Add in other activities, like eating and walking around the house, and she’s likely exhausted shortly after she wakes up and gets out of bed. This constant fatigue is wearing in itself and may require that your family member rests more than she wants to rest. Hospice elder care providers can help her to be comfortable and make sure her needs are met with far less exertion on her part. If your elderly family member has gone to pulmonary rehabilitation, she’s learned a lot of different techniques that can help her to conserve energy, to breathe better, and to improve her physical ability to move around. 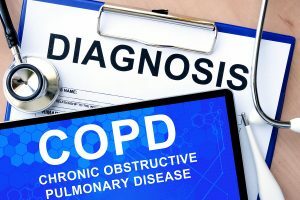 But pulmonary rehab can only help so much and your senior will eventually get to the point at which these techniques aren’t enough any longer. Hospice gives her a chance to rest more and to know that someone is able to monitor her oxygen levels. Hospital Trips Are Increasing in Frequency and Length. People with COPD find that toward the end of the illness they visit the hospital more and more often. At first these visits might only be once a year or so, but as her lungs weaken further, they’re more prone to infections and other problems. Your elderly family member might find that her initial visits are ones in which she’s not admitted to the hospital or she only has to stay overnight. Gradually it takes longer to stabilize her breathing. Recovery from Hospital Stays Is Slow. Returning from a hospital visit, even a short one, can be trying. As your senior is visiting the hospital more often and staying longer, you might find yourself realizing that her recovery time from being in the hospital is also getting longer. She may start to experience a situation in which she’s not fully recovered from her last hospital visit before she’s right back in again. Hospice elder care services can help her to avoid the hospital and therefore those long recovery periods in between. Talk to your senior about what she wants to happen with her treatment as she nears the end of her battle with COPD. She may want to continue going to the hospital longer than you think. But if she’s tired of seeing little to no results and being away from home, hospice elder care can be the right choice.